It has been confirmed by Rockstar Games that GTA 5 will be launched on both PS3 and Xbox 360 consoles and later PC, PlayStation 4, and Xbox One. A portable version of the game or more likely a spin-off is also possible. An article in 2007 claimed that the "next" GTA will have PS3 exclusivity because Rockstar want to use the full power and storage space of the Blu-Ray disc, which blows the Xbox 360s conventional DVDs out of the water for storage space. The game would need to be on multiple disc for the 360 if Rockstar were to fill a Blu-Ray disc with GTA5. "According to the November 2007 issue # 76 of the Official Xbox Magazine Sony has secured the next Grand Theft Auto, which would be number 7 in the series, to be a true exclusive to the Playstation 3. "Rockstar really wanted to make a game that you can truly only do on PS3, harnessing the power of the Cell and Blu-ray disc and this deal lets them do just that" as said by Sony's Michael Shorrock in a statement to the press. " We handed Rockstar a signed blank check because we were short sighted enough to let Grand Theft Auto's exclusivity get away from us. Oops!" Multiple Discs for Xbox 360? Since all that exclusive talk, however, Microsoft has allowed Xbox 360 owners to install games to the console's hard drive in order to reduce noise and wear and tear on the discs. Currently, this is an entirely optional process, but some games have shipped with two discs - a game disc, which you play from, and a separate 'content' disc, which installs additional details to the hard drive - in order to bypass the limitations of conventional DVDs without resorting to disc swapping. Rockstar could potentially exploit this workaround to get a huge GTA5 successfully onto the 360. In 2011 Rockstar/Team Bondi's crime thriller L.A. Noire was released on 3 discs for the Xbox 360 with each carrying a part of the story. In 2012 Max Payne 3 is on 2 discs for the Xbox 360. The first disc contains half the single player story and multiplayer while the second disc contains the other half of the story. Depending on the scope of GTA V, Rockstar may do the same. On July 2nd, 2013 Rockstar confirmed in an Asked & Answered article that GTA V would have two discs for the Xbox 360. The first is an install disc with 8Gb of data and the second is used while playing GTA 5. The PlayStation 3 version will also have the same install requirement but only one disc. We are certain Rockstar Games learned from mistakes made with the release of Grand Theft Auto IV on PC. The game was a port from consoles and had numerous issues across different computers. Many patches had to be released in the months following. For Max Payne 3, Rockstar developed the PC version alongside the consoles. This allows the game to run much better with less chance of major issues since it was created just for the PC. Rockstar has yet to confirm GTA V will be on PC but we expect the PC version to do the same and hopefully release approximately two weeks after the console versions - but Rockstar's words make us think it will be months after, if at all. It can be noted that Grand Theft Auto IV was not announced for PC until over three months after the console release. When Grand Theft Auto 5 releases on PC, the game mods that follow will likely amaze us as much as the ones seen for GTA IV. There are many talented coders out there with futures in the industry - maybe even with Rockstar Games! The handheld market is ever growing. Rockstar has released portable Grand Theft Auto games made out of console games previously such as Liberty City Stories (III), Vice City Stories (VC), and Chinatown Wars (IV). 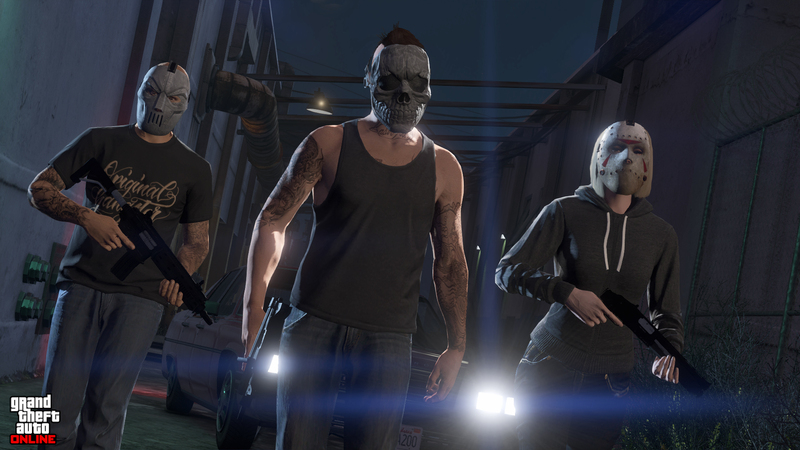 It seems likely that a smaller mobile game made from GTA V will also become available. Apple, Android, and Sony devices could see a new GTA game based on Grand Theft Auto 5 up to a year after the main game releases. The PlayStation Vita boasts some very good specs as Sony's replacement for the PlayStation Portable (PSP). The specs are so good, a trimmed down version of GTA V could release on the device, however, Rockstar Games would likely want gamers to enjoy the full experience and cutting back GTA V is not something they would do. Rockstar is definitely looking into the product and its capabilities. The Vita may be used to supplement the PlayStation 3, possibly as an additional screen similar to the Wii U's controller. While not directly confirmed by Rockstar Games, the game case for PS4 copies of GTA V show the Remote Play icon on the back which means PS4 users will be able to send the game to their PS Vita for portable gaming. It may not be a dedicated PS Vita game but it is as close as we are going to get! this is my favourite game please. Please ROCKSTAR release the GTA 5 for PS vita because this is my favorite game and I'm always watching gameplay in YouTube because I don't have PS 4 to remote play that's why please release it now(Grand Theft Auto 5) I'm sure there are many people will buy that game console for PS Vita..THANK YOU VERY MUCH! GOD BLESS! GTA 5 Platforms - Details on the platforms which GTA 5 is available for.